Notes: Double X-braced keyboard stand with textured end caps to aid grip and prevent the keyboard sliding forwards. Pull and lock ball mechanism enables quick setup and secure multi-point positioning. 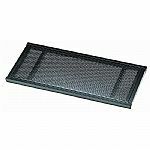 Notes: Large Perforated Metal Shelf add-on. Converts any full-sized "X" stand into a convenient table for holding drum machines, multi-track recorders or any kind of non-rack mountable equipment. Features reinforced steel bracing for added strength. Not compatible with QLX/3 add-on second tier. 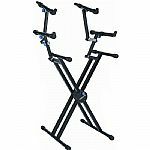 - The new "Pro Series" stands are capable of holding the heaviest keyboards safely and securely. - The absolute hands down choice of most professional musicians because of their adjustability, functionality, strength and reliability. 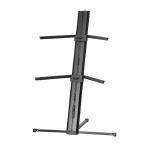 - This high-tech line of stands features the new Quik Lok "Push to Adjust" locking disc system with user-friendly push button and super heavy duty 30 mm x 30 mm steel tube bracing for extra sturdiness and structural support. - The innovative, advanced-technology upper tier set is fully adjustable in height, angle, tilt and depth, and offers the musician maximum flexibility of use. - A complete line of accessories allows musicians to customize their performance structure to accommodate their needs perfectly. 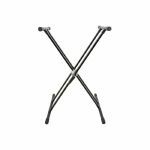 Notes: The APEX Series Keyboard Stands represent over two decades of research and development and are used all over the world by gigging keyboard players and touring musicians. The AX-48 Pro offers everything keyboard players loved about the original APEX keyboard stand while offering a sleek new design and updated features that support a whole new generation of keyboards and workstations. The APEX Series is the finest looking keyboard stands on the market, and shine the spotlight on keyboard players, while securely supporting their prized instruments. Setup and tear down takes seconds! The AX-48 Pro breaks down into a single, slender unit that's easy to transport and takes up very little room because the hollow column becomes its own carrying case! The legs remain connected and slide into and out of the base of the column, and the arms that support your keyboards are stored in compartments at the top of the column. The APEX AX-48 Pro extends stage and studio performance by providing an Accessory Slot on the top of the stand. Simply pop off the Accessory Cap and install the optional AX-48 Pro Mic Boom, for instance, and your keyboard stand is now ALSO a microphone stand. Look for more options to come in the very near future! The modern look and shape of the APEX AX-48 Pro brings the keyboard player out from behind a stack of no-character keyboard stands, and into the spotlight with the rest of the band. The footprint of the new AX-48 Pro has not changed from the previous APEX, but now offers an updated column design that is as esthetically pleasing as it is performance ready. Everything keyboard players have come to appreciate about the APEX keyboard stand for over two decades is still available in the new APEX AX-48 Pro. It's THE original column style keyboard stand that securely holds two keyboards out of the box (up to 125 lbs. each!). The patented Tribar arms are height adjustable, the support legs are super stable, and it's incredibly easy to setup, tear down, and transport from gig to gig. Keyboards, synthesizers, and keyboard workstations have evolved in the last two or three decades since the original APEX was developed. The APEX AX-48 Pro now ships with two sizes of Tribar arms (one set of 13" arms, and one set of 18" arms) to safely hold today's keyboards, synthesizers, and keyboard workstations of all sizes. 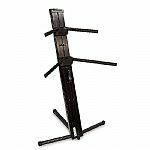 The APEX Series Keyboard Stands represent over two decades of research and development and are used all over the world by gigging keyboard players and touring musicians. The AX-48 Pro offers everything keyboard players loved about the original APEX keyboard stand while offering a sleek new design and updated features that support a whole new generation of keyboards and workstations. The APEX Series is the finest looking keyboard stands on the market, and shine the spotlight on keyboard players, while securely supporting their prized instruments. Notes: Have you ever wished your keyboard stand and microphone stand were the same stand? Tired of trying to figure out where to put your mic stand when playing keyboards? This extremely convenient boom adapter and boom arm is for use with the APEX AX-48 Pro keyboard stand. Simply detach the accessory compartment lid on the top of the APEX AX-48 Pro, snap this microphone boom adapter into place, tighten the two bolts (Allen wrench included), and attach the included Ulti-Boom boom arm and you're all set! We know how difficult it can be to perfectly place a microphone when playing keyboards - especially if you're playing two keyboards. The AX-48 Pro Mic Boom is a great addition to the APEX AX-48 Pro keyboard stand. Combine the two and you have a legndary keyboard stand with two teirs and one of the finest telescoping mic stands ever designed - all in the same stand! You'll be able to add this mic boom to your APEX AX-48 Pro quickly and easily. It takes just minutes to install the AX-48 Pro Mic Boom. Simply remove the accessory cap on top, pop in the adapter, tighten the two bolts using the included Allen wrench, and attach the Ulti-Boom boom arm. It really is that easy! When it came time to design a new generation of microphone boom arms, Ultimate Support decided to throw known conventions out the window and give way to innovation. Welcome to the Ulti-Boom professional microphone boom arm. The Ulti-Boom mic boom arm features a heavy-duty, die-cast counterweight, ergonomic adjustment knobs that feel great in your hands, and lightweight (yet durable) anodized aluminum tubing with internal glides that ensure fast, smooth, noise-free adjustment. Ulti-Boom by Ultimate Support has redefined how professional boom arms should perform.